September 21, 2007: NASA's Mars Odyssey spacecraft has discovered entrances to seven possible caves on the slopes of a Martian volcano. The find is fueling interest in potential underground habitats and sparking searches for caverns elsewhere on the Red Planet. 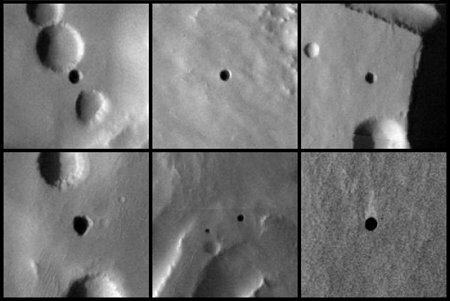 Evidence that the holes may be openings to cavernous spaces comes from the temperature differences detected from infrared images taken in the afternoon vs. the pre-dawn morning. From day to night, temperatures of the holes change only about one-third as much as the change in temperature of surrounding ground surface. A report of this discovery by Cushing and his co-authors was published online recently by the journal Geophysical Research Letters. The Jet Propulsion Laboratory manages Mars Odyssey and Mars Reconnaissance Orbiter for the NASA Science Mission Directorate, Washington. Arizona State University operates the Mars Odyssey's Thermal Emission Imaging System. For additional information about Mars Odyssey and the new findings, visit the Odyssey mission home page. "The key to finding these [skylights] was looking for temperature anomalies at night -- warm spots," said Phil Christensen of Arizona State University, Tempe, principal investigator for the Thermal Emission Imaging System on Mars Odyssey. That instrument produced both visible-light and infrared images researchers used for examining the possible caves.